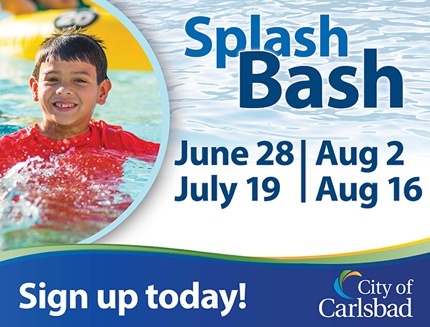 On Saturday night, July 19, 2014, the City of Carlsbad is giving parents the chance to drop the kids off at the new Alga Norte pool and have two hours to themselves. Splash Bash is designed for children 8 and older, but kids younger than 8 are welcome when accompanied by an adult. Attendees will spend an evening playing on giant inflatables, walking on water in giant water balls, diving off of diving boards and dancing to music under the lights poolside. Tickets are $10 per person. One child, age 3 and under, may be admitted free with a paying adult. We know how great two hours can be. It’s not long enough for a movie, but definitely long enough to get dinner or something. For more info, click the link.